Despite Christopher Plummer’s J.P. Gettty very clearly being the antagonist in director Ridley Scott’s All the Money in the World the film also seems aware that this is very much a complex character that holds more substance and conflict than what might otherwise be optioned to be portrayed as the straight-up villain of the piece. That said, Scott will often times play to the dark comedy of how much of a penny-pincher the richest man in the history of the world was. Such is true when the director will set-up a scene with the intention of making the audience think one thing only to pull the rug out from under them a moment later; Getty not actually bargaining on the cost of the ransom, but rather on that of an otherwise invaluable painting for example. This technique emphasizes the relationship, the fondness, the affinity Getty has for his money in a movie that is about his refusal to fork over untold millions for something that might offer a greater relationship or something he has a greater fondness and a greater affinity for: his grandson. This again may make Plummer’s Getty out to sound like the obvious villain of All the Money in the World, but there are lessons to be learned-even from those who might not be the most sincere or honest people in the room. Getty might not have always even been the smartest person in the room at any given time for he himself says that any fool can “get” rich, but there is always a strategy or plan in place with Getty-an ability to read the room and/or any offer that came across his desk-that paints this portrait of a man who isn’t being let off the hook for his misplacement of priorities in life (it’s hard to read if the man might have even had any regrets in his final moments when it came to realizing all he had were things and no one in particular that cared about him that he could leave all of his things to), but rather is being conveyed just as he was which was anything but complicated-the man seemed to have a very strict code of conduct-but is all the more complicated for applying that code to every aspect of life. After all, Getty likely could have cared less what anyone thought of him given the power such wealth afforded him. This all brings the conversation back around to that golden rule of he who has the gold makes the rules and in the case of All the Money in the World and the narrative it encapsulates, Getty never takes his hands off the wheel. Thank God for Christopher Plummer. For the record, director Ridley Scott is eighty. His birthday was last month and this month, just a few days ago, his second film of 2017 hit theaters. 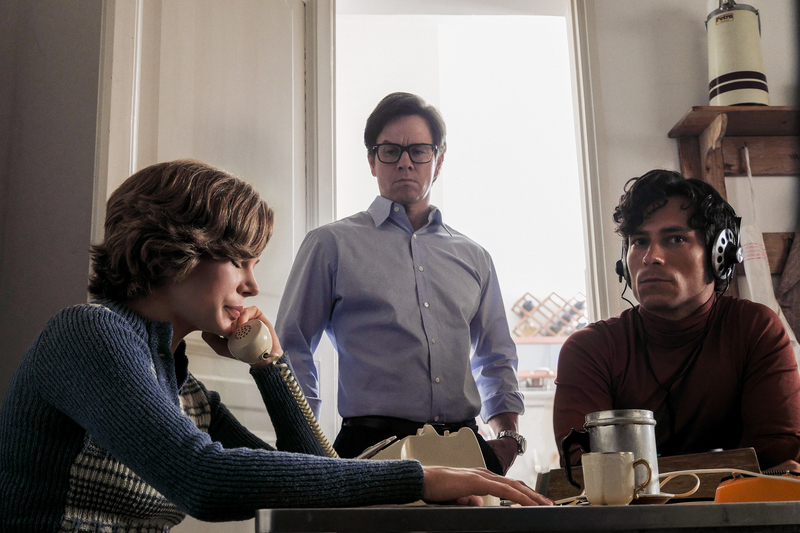 Not only this, but the force of nature director made the decision just over a month ago to completely re-shoot all of the scenes in All the Money in the World that featured the aforementioned J.P. Getty character as originally portrayed by Kevin Spacey with that of Plummer’s performance. In an amazing turn of events, Scott was able to re-shoot all of Spacey’s scenes in a matter of nine days and while it may initially cause one to think that Spacey’s involvement might have been minimal this is what makes the turn around all the more incredible. Not only is Getty a large part of the films arc, but he shares scenes with co-leads Michelle Williams and Mark Wahlberg thus forcing those actors to have to come back at a moment’s notice to re-shoot entire scenes that they’d already done months if not nearly a year prior. How Scott and his team handled the continuity is beyond me because the biggest accomplishment of All the Money in the World is the fact that if you had no idea about this behind-the-scenes controversy then you would have no idea anything was off with the picture at all. There is a single moment in a scene where Getty visits the desert and we can see that shots of Spacey’s Getty were still utilized and that Plummer’s face has been digitally imposed on a wide shot rather than having been re-shot, but these are things to be noticed only if you’re looking for them. Otherwise, the biggest detracting factor of the edits from scenes originally shot for the film and those that were shot a month ago is that of the length of Wahlberg’s hair-which, of course-isn’t a deal breaker. The real revelation to come out of all of this if one does go into the film knowing the behind-the-scenes drama is that of how effective Plummer is in his role. Whether it was the way the trailer played it or that of Spacey’s truly different take on the character, Getty originally felt like less the star of the show and more the catalyst for the actions that forced Williams and Wahlberg’s main characters into the main thread of the action. Whatever pre-conceived notions the Spacey trailer might have given potential audiences can be swept under the rug as Plummer is a crucial part of the mindset of this film and more or less pushes the narrative themes forward with each and every scene he appears and with each and every action he takes within those scenes. The film is based on the true story of the 1973 kidnapping of 16-year-old John Paul Getty III (Charlie Plummer) and the desperate attempt by his mother, Gail (Williams), to convince his billionaire grandfather (Plummer) to pay the ransom. When Getty Sr. refuses, Gail attempts to sway him as well as come up with the money herself as her son’s captors become increasingly volatile and brutal. As a result, Gail and Getty’s advisor, Fletcher Chase (Wahlberg), become unlikely allies in the race against time that ultimately reveals this lasting value of love over money. With a screenplay by David Scarpa (2008’s The Day the Earth Stood Still) All the Money in the World only makes you think it is a kidnapping/race against time thriller, but in all honesty this is a movie about Getty senior that has chosen to focus on what ultimately comes to be the last few years of his life as condensed for dramatic purposes. Up until the end, Getty is a man constantly surrounded by parasites-this extending to his family that includes his grandson’s father, his son, in John Paul Getty II (Andrew Buchan) who reaches out to his father, a man he’s never had any relationship with, for a job that he is granted and ultimately ends up fumbling because he becomes addicted to drugs. This is undoubtedly one of the many reasons Getty Sr. is a man who has to be in control otherwise he loses this edge that he’s been able to maintain his entire adult life that has therefore allowed him to keep himself in this position of wealth and power. Getty doesn’t take risks outside of his calculated business ones so as to not stand the chance of being threatened. It makes sense as to why he reacts to the news and ransom of the kidnapping of his grandson the way he does, no matter the admittedly special place Paul held in his heart. To oblige would be to give in and to give in would be to give way for those to earn the same lifestyle he had to work to obtain. What is interesting about the events that were chosen to be depicted in All the Money in the World though, is that this set of circumstances seems the first time Getty had to truly contemplate if the money was worth the loss of this blood relative he’d once invested so much hope in. Of course, money is never just money and typically stands in for something this person behind the wealth doesn’t have or so Wahlberg’s Chase tells Williams’s Gail shortly after they are introduced to one another. Though Scarpa nor Scott seem to necessarily be interested in what it is behind the facade that makes Getty Sr. tick, but more the facade itself the film can’t help but to give over to such ponderings thanks in large part to Plummer’s layered performance. There is a scene in the film where Getty Sr. discusses the difference in getting rich and being rich and it is in this gray area that Plummer seems to zero in on bringing out his character’s mentality in each and every action. “Any fool can get rich,” Getty advises, but it is the remaining rich, the “being” rich that takes a sophisticated mind. It seems Plummer’s Getty Sr. wanted very much for his grandson to grasp this difference in “getting” and “being”, but such ideas are never followed through on as they weren’t of Scott’s initial intent. 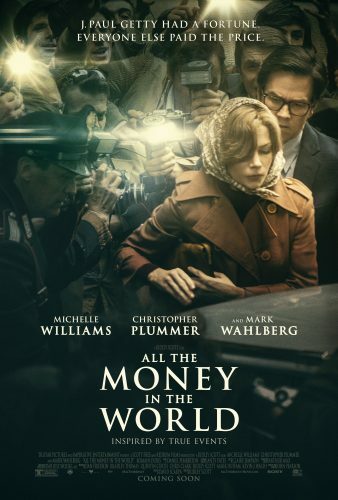 Rather, All the Money in the World quickly devolves into that aforementioned race against time thriller that is still very much an interesting, well-acted, and great-looking movie, but beyond this it is never compelling in the way it feels it is meant to be. That said, all of the performers here are at the top of their game as Williams is especially present in her role as Gail-a scene where she is required to identify a body standing out as the pinnacle of her performance. Wahlberg is more restrained here than we have seen him in some time. It may be that the actor’s last few performances have been so in your face mister tough guy with Deepwater Horizon, Patriot’s Day, Transformers, and Daddy’s Home 2, but whether it is because Chase is a different type of personality or Wahlberg is trying out something different, the performance hits the right notes-allowing for Wahlberg to show his bread and butter in a pivotal scene near the end of the film. The younger Plummer, Charlie that is, is notable in his rather thankless role despite being the subject of nearly every action that is taken in the film. Having met the young actor a few years back at a screening of his film, King Jack, it was clear the kid had good, natural instincts and so it was no surprise when he ended up on the short list for potential Peter Parker’s/Spider-Man’s in what would eventually become Homecoming. With this and another festival darling this year, Andrew Haigh’s Lean on Pete, though it seems Plummer is destined for his own strong path and he begins paving that by turning in a performance that grants sympathy to a character who very much could have been simply served by anyone embodying the trials and tribulations John Paul Getty III had to endure while being held captive by the Calabrian Mafia for more than five months. What saves such sequences is the fact Plummer is given someone else to play off of and whether Romain Duris’s Cinquanta character is fictional or not it was both a smart move on the part of Scarpa to include or create such a character as Duris’s performance comes to serve as the most surprising and enlightening of the whole picture. Cinquanta is a character that begins the film as another crony in the kidnapping scheme, but is the first to show the victim his face, to risk getting to know him by conversing with him, and ultimately who comes to feel pity for this privileged boy who could have had the world were his childhood and role models not been so dysfunctional. While Wahlberg and especially Williams are the characters we follow on the main mission it is Cinquanta that has the biggest arc in the film and the one that is something of a conduit for the audience to understand the ever-changing dynamic between Getty III and his captor. What develops between Cinquanta and the young Getty is a pure connection as both have more to lose than they have to gain by feeling sorry for one another and it is this exact type of relationship that Getty Sr. seemed to only find in beautiful things, but never in other human beings. A shame to be sure, but also a shame is the fact All the Money in the World can’t help but feel as detached as Getty Sr. despite a minefield of ideas and themes laid out before it.